This news story was published on February 4, 2019. 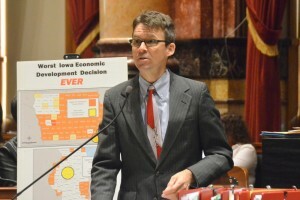 DES MOINES – State Senator Joe Bolkcom of Iowa City today announced he is preparing legislation to end marijuana prohibition in Iowa. Bolkcom said regulating marijuana like alcohol would also create new businesses, jobs and economic activity in the state of Iowa. Bolkcom said the challenges of regulating the use of marijuana are similar to those involved in regulating alcohol. Bolkcom said failure to end marijuana prohibition will cost Iowa jobs, new businesses and millions in lost tax dollars. He pointed to the fact that other Midwestern states like Michigan, Minnesota and Illinois are moving towards legal marijuana regulation. Marijuana prohibition is ineffective and expensive. made Iowans significantly safer or healthier. toxic, less addictive and less lethal than alcohol. legal bills, jail time, broken families, violence and crime. at every Hy‐Vee, Casey’s and Kum and Go. unregulated and untaxed in the shadows. illegal sellers operate anywhere and sell to minors. drugs that are much more addictive and harmful. million each year in new revenue. While I’m not condoning or disapproving it, it’s coming. Why does Iowa always seem to be the last holdout for change. There are millions to be made for the state coffers, and possibly new jobs created with it’s legalization and regulation. When money comes into the state that could possibly ease my tax burden, why not do it. Come on Iowa, do something, it’s coming, don’t be the caboose.